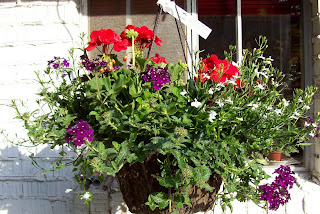 The fact that I'm posting more pics of flowers might give you a hint...the knitting progress is nil. :-( I think I have given up (for now) on Eunny Jang's Print 'O the Wave Stole...I hate to admit defeat, but it's just too hard for me. I've only knit two lace projects in the past, plus one little bitty sampler - and although I did complete them successfully, it was a struggle. However, the lace-knitting mojo is still strong, so I looked though Barbara Walker's second book of patterns and picked out two 8-row patterns that looked do-able. I'm knitting a practice piece that I'm calling the "Why Can't I Knit Lace?" (WCIKL) sampler. I'm doing a center panel of Fountain Lace (p.272) with Branched Fern (p.314) on either side, and selvage stitches at both ends of the needles. I provisionally cast-on 53 stitches - the plan is to go back after one side of the sampler is "done" and pick up the provisional stitches and knit the other side...and then, if I'm still feeling the love, to attempt knitting-on a border all around. If nothing else this will give me practice in the knitting of lace. 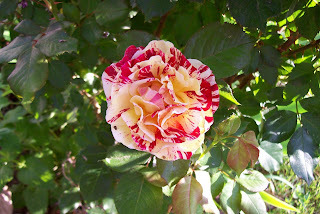 And this is a close-up of one of our roses - I don't have a clue as to it's name so I just call it our "Stripey" rose. Very perfumy. My learning curve with blogging has hit another stumbling block. You might notice that I have a "button" in my sidebar for Knitter's Coffee Swap, but if you click it, nothing happens. I'm trying to place button-links to other websites in my sidebar, but so far I haven't figured it out. There is apparently some help in (Google) blogger groups, but I can't get the info to upload so I can't read about it. I hate feeling so ignorant! Gotta go. WCIKL is calling!